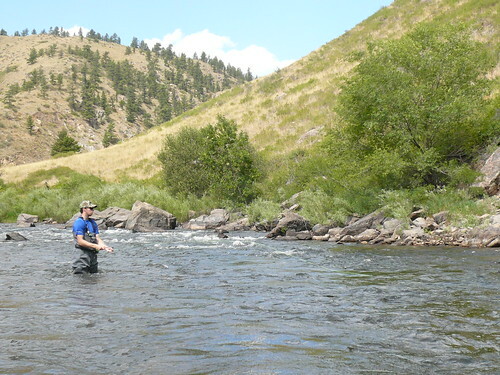 Kevin's parents came into town last Wednesday, August 31, 2011 and one of the things they wanted to do in Colorado was fly fish, a lot, so we made sure we did just that! 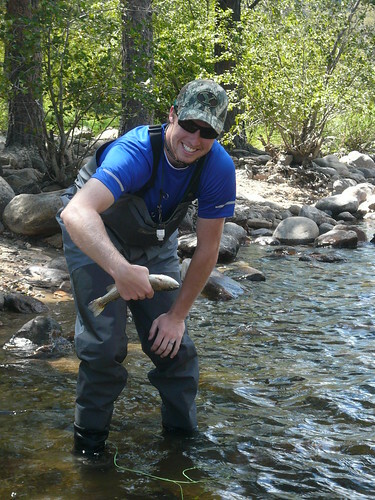 Thursday, September 1, 2011, we got a fly fishing guide from St. Peters Fly Shop in Fort Collins to help us all become better fly fishers! We went fishing from 8am to 6pm! Crazy right? 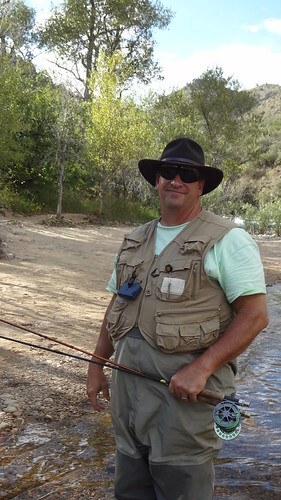 I have been fly fishing on and off for years, mainly off, haha. But my dad is obsessed with fly fishing so I grew up fishing with a normal fly rod and now my husband is obsessed too. All thanks to my dad who got him a camouflaged fly fishing rod for his first birthday after we got married lol. 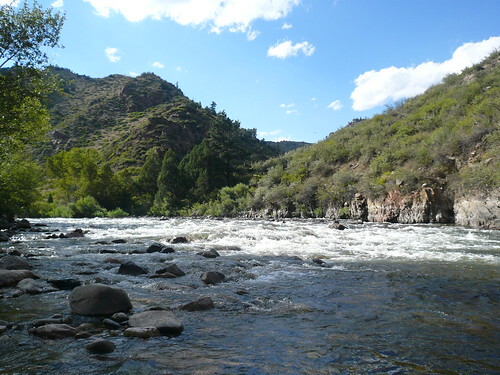 When I was probably in junior high, we had a family reunion (on my dad's side) and we got a fly fishing guide and floated a big river in Jackson Hole, Wyoming. So this was my second time with a guide..
Anyways, we hit up the Poudre River in Roosevelt National Park, about 30 minutes away from our house in Fort Collins. 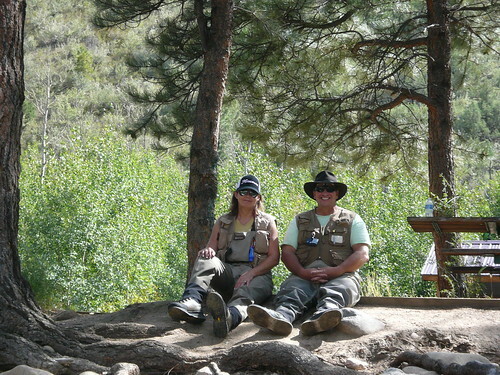 Here we are right before we entered the Poudre River! And yep, those glasses are polarized which helps you see into the water and see the fish! Pretty sweet I'd say! Here is Kevin with a legit cast. The guide was right next to me and I spotted a fish swimming nearby. I watched that fish for about 10 minutes and kept casting the fly right near it hoping I'd catch that fish! The guide and I were just hoping he'd take a bite on my fly and then the guide said to Kevin, "Hey Kevin, come over here! Throw your line in right here and try to get this fish!" Kevin comes over and throws his line in and the fish bites on and he catches it right away! It was so not fair! I'd spotted that fish and had been working on getting him for awhile and Kevin just steals him! Ha. It was SO lame! Did you know if you hold a fish belly up (like Kevin in picture below) it relaxes the fish and they don't squirm and wiggle as much? It doesn't look as cool in pictures but they are easier to hold! Kathy & Greg just taking a break by the picnic table. We had a good lunch from Gib's Bagels. Gib's Bagels is a bagel shop with the best bagels made daily with the freshest of ingredients. When I was in high school I ate here once or twice a week! So good...! At lunch, Kevin had a soda pop and there were bees flying around and one flew into his soda can and he didn't realize it...Kevin took a sip and noticed a bee on his tongue and then spit it out ALL over the table! It reminded me of the movie It's Kind of a Funny Story where whenever the boy gets nervous or anxious he projectile vomits haha! Anyone seen it? Alexis from Alexis Laughs recommended it and of course I had to watch it. I worked at a psychiatric treatment center for at-risk youth and it was one of those types of movies! 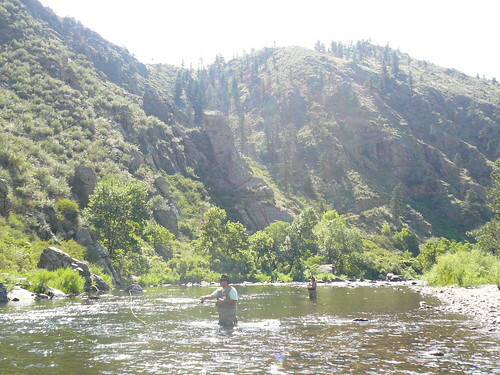 The Poudre canyon is gorgeous right? 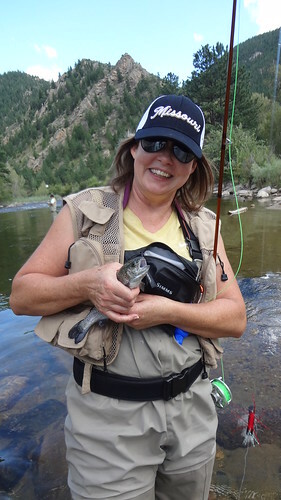 Kathy with a trout! If I remember right it is a rainbow trout. I caught this fish and while holding it my hair got caught in the fishing pole! So the fish was flipping and flopping all around and tugging on the rod, meanwhile, my hair was stuck! I didn't want it to get ripped out or anything, obviously haha. So Kevin took this picture and somehow my hair got out - I think it was the guide who helped me? Haha. I don't know. But it was funny. Anyone been fly fishing before? Haha sounds like an eventful trip! I've never been fly fishing, or fishing really at all (funny because I grew up on a lake) but looks like you guys had a blast! hahaha! WOW! Sounds like quite the eventful fishing trip. :) I haven't been fishing for YEARS. I always enjoyed it when I did go though. 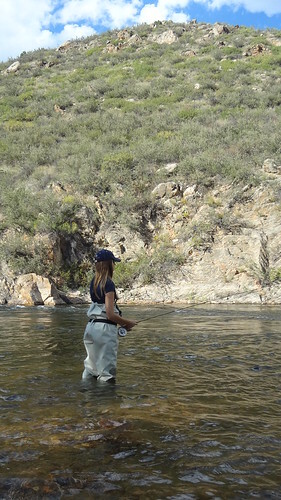 I've never been fly fishing, it seems kinda difficult. haha! oh man! that is too funny. i would have been laughing so hard if my hair was stuck. all in all this looks like fun. 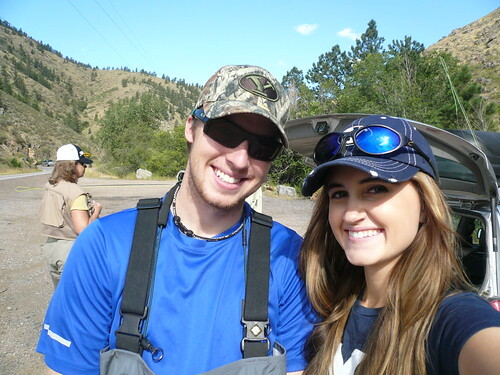 glad you had a wonderful time :) plus you are probably the cutest fisherman ever. I've never been fishing of any kind before but this makes me want to go! The picture with your hair caught is pretty funny. :) And I loved all of your funny stories! we've been wanting to see its kind of a funny story but when we got it from netflix it was so scratched and our computer wouldn't play it. 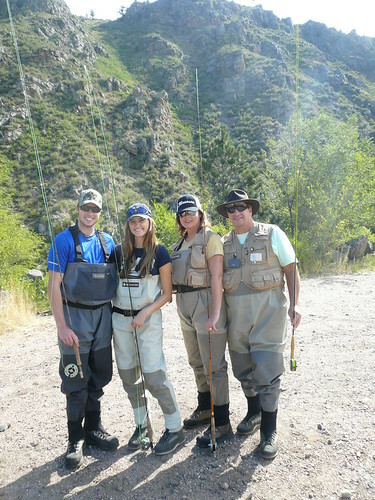 also, i cant believe you have your own waders. you are completely legit. do you dry fly, nymph, hoppers, etc? You all look adorable in your fishing get-up! 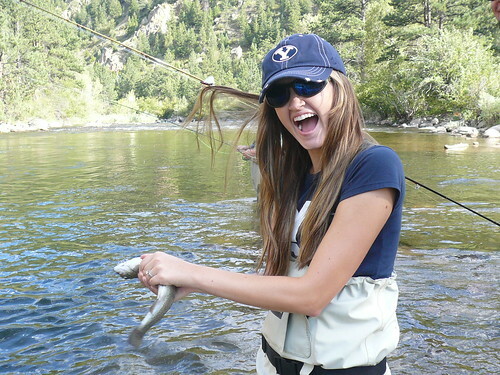 =] I've always wanted to try fly fishing! Glad you guys had a great time. this looks like so much fun! I have never been before but i seriously want to go now. and funny stories! Looks like a really fun weekend! 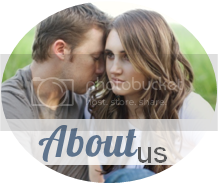 Love your pics! 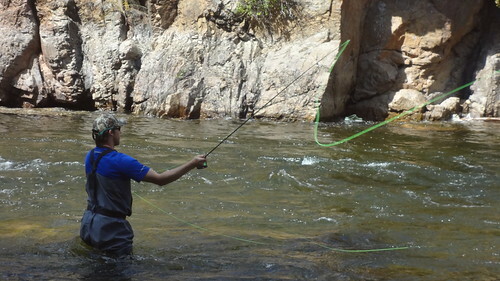 I actually took a fly-fishing course when I was in high school! I come from an extremely small town: where hunting and fishing is prime! Although, I haven't done much fishing since I moved to Sacramento (about ten years ago). LOve these pictures, it looks like a good time! Never been but would al do it just so I can wear the nifty outfit! You look adorable. And it looks fun! Looks like you guys had a great time! Sounds like so much fun!